Perth Festival’s Chamber Music Series kicked off last night with a collaboration between the Brodsky (UK) and Calder (US) Quartets. Both quartets have a deservedly high profile in the festival: the Brodsky will perform all 15 string quartets by Shostakovich and the Calder will profile contemporary repertoire alongside Beethoven classics. I had a hunch the octet collaboration would be the highlight of the chamber music concerts: a meeting of two legendary ensembles; a profound dialogue between eight magnificent artists; the frisson of friendly rivalry. Well I guess the good thing about a blog is that you can be frank: I was underwhelmed. The light repertoire (perhaps an antidote to the intensity of the concerts to come) and the breezy approach of the artists meant the concert felt like an afterthought, a social outing before the real thing. 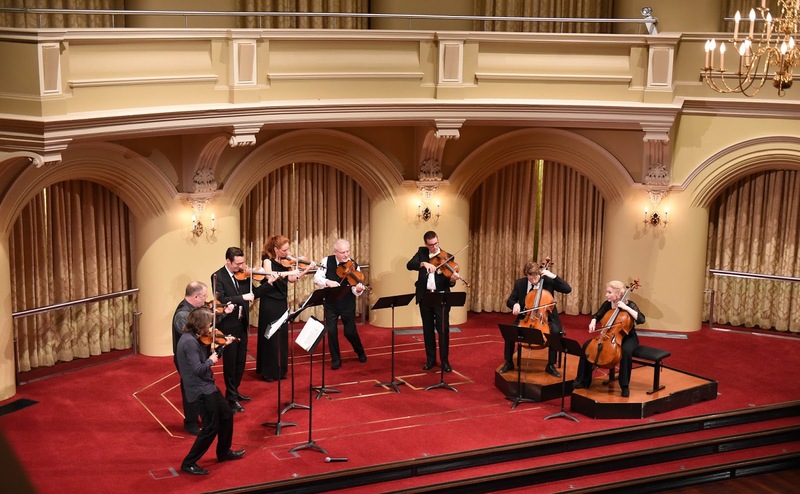 The program featured Mendelssohn’s Octet supplemented by Shostakovich’s intense but brief Two Piece’s for String Octet plus arrangements (described candidly by violinist Daniel Rowland as encore arrangements) of three orchestral classics. The entire concert including interval was over in under 90 minutes and the meatiest part was the program note by Gordon Kerry, who can make meaningful connections between even the most unrelated of pieces. Government House Ballroom was almost full with audience members spreading to the balconies. 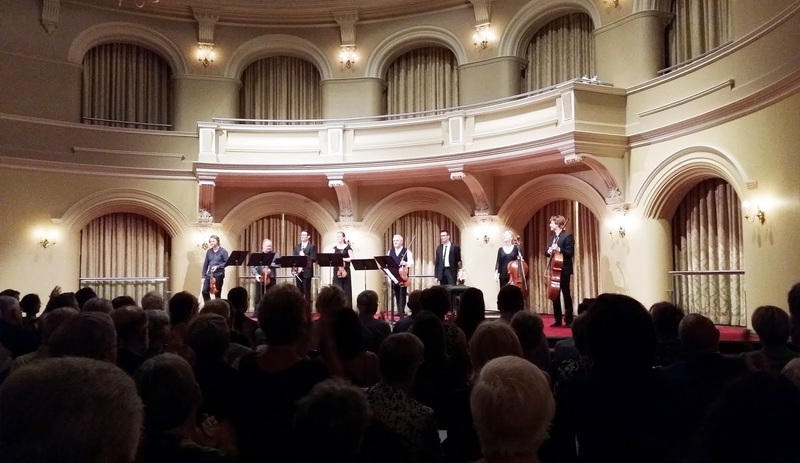 The room’s resonant acoustic suited the octet, lending a brightness and immediacy to the string sound. In the first half of the program the four violinists shared the leadership of the ensemble which indicated a convivial partnership between the artists. But there were also pitch issues and a lack of cohesion which pointed to a lack of rehearsal. The octet arrangements were by the multi-talented Paul Cassidy, the viola player from the Brodsky Quartet. The frenzied outbursts and sardonic humour of Shostakovich’s Two Pieces were well-conveyed, while Khachaturian’s Sabre Dance highlighted individual players and their unswerving musical commitment. Barber’s Adagio was less successful; the work’s intensity is built from the density of sound and in octet form it felt vacuous in parts. In the second half Daniel Rowland, principal violin of the Brodsky quartet, led the ensemble in Mendelssohn’s Octet and although I admired his clear musical intent when the group were here in 2009, this time his charisma felt over the top and noisy. Despite this I found myself marvelling again at both the delicacy and vociferousness of Mendelssohn’s precocious writing. Of course music appreciation is a subjective game and while I felt disappointed many in the audience gave a standing ovation. Thankfully there is much more to come over the weekend.